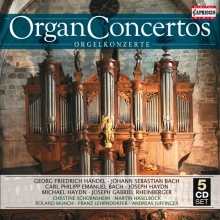 This 5CD-Set includes some of the most important and most impressive concertos for organ with instrumental accompaniment and shows us also the interesting development of this concert genre from Baroque periode to the romantic era. One of the most famous virtuoso performers of his day and age on the organ and the piano, George Frideric Handel was the first composer in the history of music to liberate the organ from its liturgical context and turn it into a concert instrument. At the first performance of his oratorio "Deborah", on March 17th, 1733, he also for the first time played one of his organ concertos as interval music on a small instrument without any pedals. Two years later, the official announcements of performances of his spiritual works were already referring to these "incidental pieces" as a special attraction for audiences seeking musical diversification. In the 18th century, particularly in its second half, very basic changes in musical life and far-reaching shifts in style occurred, having a lasting effect also on the area of organ music. The fortepiano began its victorious advance, bringing to an end the earlier predominance of the harpsichord and the organ. Pieces that are rich in harmony and full of affect changes causing tension can be more graphically presented on a pianoforte with its wider range of dynamic means than on a harpsichord. 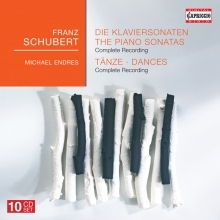 Other pieces more deliberately placing emphasis on a splendid sound and representation suggest a performance on the harpsichord whose wealth of harmonic overtones are better suited to hold their own against an orchestra and in larger halls than the comparatively intimate sound of an early Viennese pianoforte. Against this background, the organ presents itself as a moderator between both instruments. Because of its many registers, it has tonal versatility available and is able to effortlessly make itself heard due to its acoustics.Haydn definitely cannot have envisaged the type of an opulent church organ, but rather a smaller "cabinet organ" as it was found in the music rooms and small chapels of the wealthy bourgeoisie or nobility. The soloist, accompanied by a small circle of instrumentalists, was, very likely, the composer Haydn himself. „Singing is the foundation of everything in music“, wrote Georg Philipp Telemann, and this basic musical truth still holds good today. 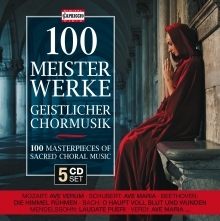 This 5CD-Set with 100 Masterpieces can be an incentive to reflect once again on the foundation of music and, additionally, to become acquainted with the diversity of sacred choral compositions. For precisely in this sphere the most compositionally lavish, musically captivating choral works were written. This particularly applies to J.S.Bach, Mozart, Schubert, Mendelssohn, Brahms and Bruckner. Specially recordings by these and others have been assembled here, partly in the original scoring with a boys’ choir. What earlier was current practice is today almost a rarity. 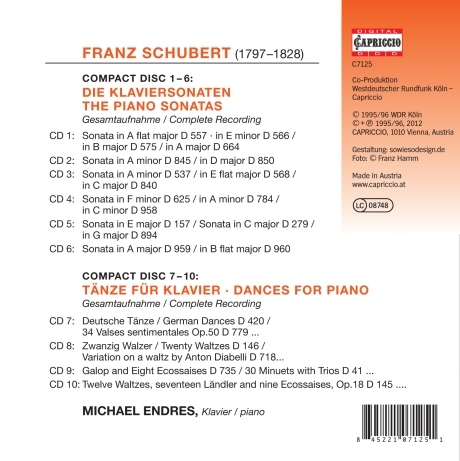 SCHUBERT: Ave Maria · MOZART: Laudate Dominum · SILCHER: So nimm denn meine Hände · HAYDN: Die Schöpfung / The Creation (Chorus) · MENDELSSOHN: Ave Maria · BACH: Jesu meines Herzens Freud · TRADITIONAL: Meerstern ich dich grüße…. 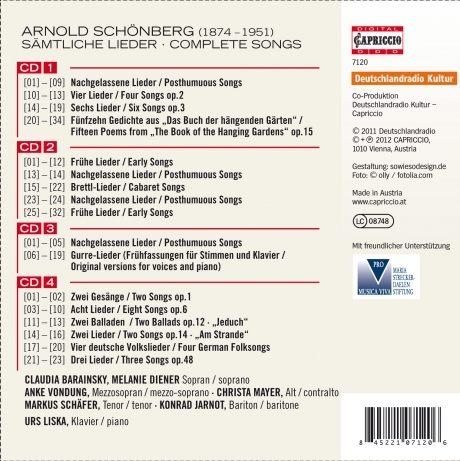 BORTNJANSKY: Ich bete an die Macht der Liebe · BACH: O Haupt voll Blut und Wunden · SCHUBERT: Stabat Mater · BRUCKNER: Ave Maria · BRAHMS: Ein Deutsches Requiem / German Requiem (Selig sind)…. 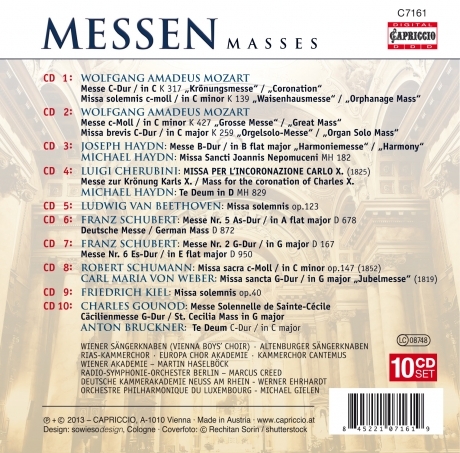 This 10 CD-Set offers a collection of the most popular Mass compositions from the Viennese Classics up to the romantic period. 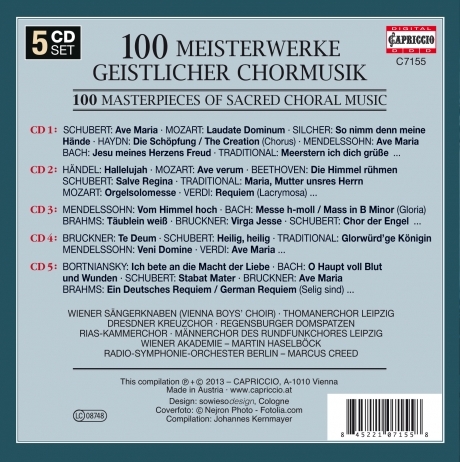 It includes famous masterpieces like Mozart’s „Coronation Mass“, Beethoven Missa solemnis, Haydn „Harmony Mass“, Gounod St. Cecilia Mass but also rarities like „Missa Sancti Joannis Nepomuceni“ by Michael Haydn, the „Coronation Mass“ by Cherubini, „Missa sacra“ by Robert Schumann and the „Misa solemnis“ of the german romantic composer Friedrich Kiel. 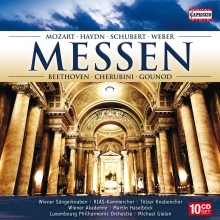 Performed by well known artists like the Vienna Boys’ Choir, RIAS Chamber Choir, Tölzer Boys’ Choir, Wiener Akademie and last but not least also includes the spectacular recording of Beethoven’s Missa solemnis with conductor Michael Gielen.